Home > Eyebrows & Eyelashes & Tips > Colour mascaras. Are you green as a gooseberry in this subject? You have to read this! Although nothing will ever replace blackness of your favourite mascara, maybe it is sometimes worth giving a try to something more colourful, especially in the summer? Colour mascaras are now trendy as world fashion houses have been taking advantage of this product’s potential more and more often. Once correctly matched with our image and colour of the iris, such products can work miracles. Want to try it? Colour mascara can suit you better or worse; it depends on your colour of the iris and your beauty type. At the beginning, it is suggested taking cautions steps and choose toned shades, the ones that will bring out colour of your iris. Hence, put pink and intensive yellow shaded mascaras back onto their place on a shelf. The beginners will win more starting with applying mascaras of beautiful, deep shades of green, violet or blue. 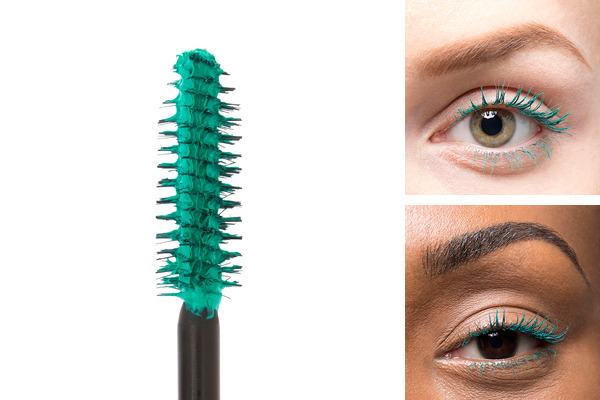 There is yet another rule that applies to using a colour mascara, and it must be followed! The remaining cosmetics we are going to apply on the face have to be of delicate, toned shades. After all, you make-up is supposed to define your beauty, not shock other people. Probably this is the most popular colour, winning the third place after a black and brown mascara. Why is that? Because it matches almost all colours of iris and at the same time is able to whiten the white of the eye by delivering depth to look. Naturally, it is available in several shades. Dark eye frame owners and the ones whose complexion is rather dark should reach for a navy blue mascara. It is a perfect shade for green and hazel-eyed people. It has a surprising power of making eyelashes more attractive and fuller. However, in order to avoid the weird effect of bruised skin under eyes (some shades of violet simply work this way), it is suggested choosing smart shade of dark plum. The ideal match is a brown eyelash line and eyeshadows of delicate beige colour. While buying a green-coloured mascara, you have to take into consideration its shade, too. Let go the idea of coating your eyelashes with flashy green shades, unless you are going to a club with techno or dancehall music. The best shade of green, that will make your eyelashes beautiful, is bottle green, so-called ‘forest green’, or khaki. It is suitable for women having green, brown or hazel eyes. Despite brown eyeliner and beige eyeshadows, you can complete your makeup by adding pearl or sapphirine eyeshadows or eye pencils. It is also advisable to apply silver or gold lines along eyelash roots. Mind you, creativity is welcome! Experiment not only with colour of a mascara but also with the place you apply the product on. Do you want to coat just the tips of eyelashes or maybe individual lashes on the lower eyelids only? Go on! Definitely, we are for this idea!